This is a problem that a dynamic team of professionals at Resilmount, has been working on for years. Resilmount has earned a reputation as an industry leader by constantly developing new ideas and providing revolutionary solutions for the building industry. Resilmount’s Patented Thermoplastic Rubber – This is the core of Resilmount’s sound isolation products. The thermoplastic rubber outperforms standard rubber because of its unique natural absorbing characteristics and its ability last longer than any form of natural rubber. Resilmount’s unique sound cell design guards against structure borne vibrations transferring into the body of the clips and mounts because of its strong column design reducing the percentage of contact surface area with the structure or substrate it is fastened to. This aids in absorbing vibration and breaking up airborne sound at its transfer point. Direct Fix Furring Channel Mount – This mount decouples the gypsum board from the framing or structure to reduce airborne sound vibrations as well as impact insulation class (IIC) vibrations. These can be used in both walls and ceilings. Keeping the framing and the gypsum board out of direct contact with the structure reduces the sound vibration transfer that is generated by that interaction. Resilient Isolation Hanger – These provide support for–and sound isolation of–internal suspended ceiling systems and acoustical ceilings. This isolates the ceiling system from the structure which reduces both structure and airborne noise. These are just a few of the sound isolation products available from Resilmount. Resilmount has a variety of different sound isolation clips, resilient mount clips, sound isolation hangers and other soundproofing materials available to meet your project’s specific needs. 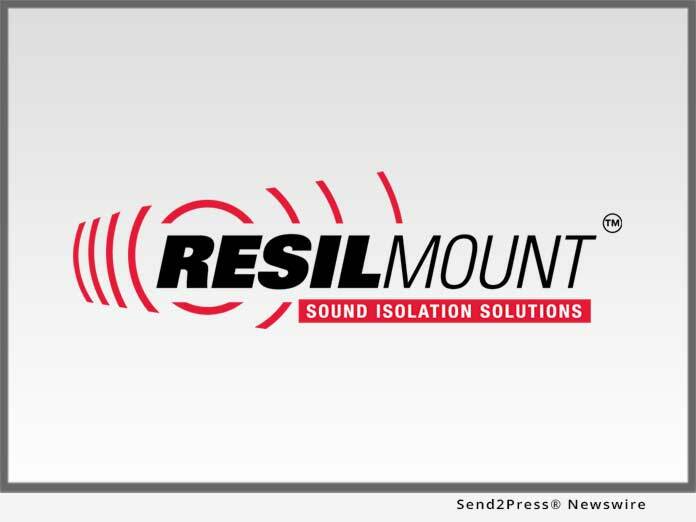 Developed by Studco Building Systems, Resilmount focuses on providing cutting edge sound-isolation systems for the construction and building industries. Resilmount’s sound isolation products provide air borne and structure borne noise control for buildings such as apartments, hotels, retail and professional spaces, and much more. Dedicated to continuous development of innovative sound solutions, Resilmount strives to work closely with the project team to provide the best solutions and be sure that our products perform to the highest standards per the development’s or building’s needs. With Resilmount products precision manufactured by us at Studco Building Systems, we have complete control over the quality and the standard of material used within each individual sound isolation clip. Our quest for optimum quality is continuous, pushing our sound isolation clips and hangers to extremes through continuous third-party fire testing and sound testing you can be sure that they will meet or exceed the architectural specifications required. Developed by Studco Building Systems, Resilmount focuses on providing cutting edge sound-isolation systems for the construction and building industries. Resilmount's sound isolation products provide air borne and structure borne noise control for buildings such as apartments, hotels, retail and professional spaces, and much more.